Hopefully it's ok to post this here. This is just a heads up for everyone. also, it looks like they output to a XML format they are calling SCML and a lot of people are already making it compatible with different engines. Thanks for reposting it @ndoss, and lucid if you check back I think the forum lost your account when a few hours were lost and it had to be restored from backup. oh right and as I said before congrats on the big success with kickstarter! I added a new spriter example -- it uses pubnub to control the movement of the hero. 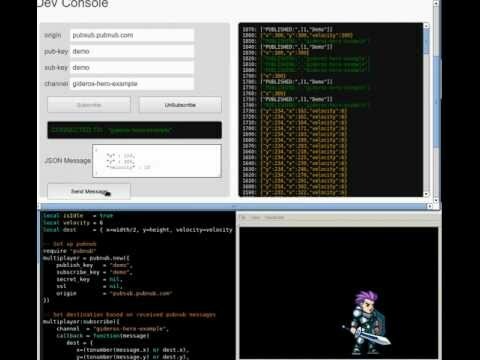 The code is in our github repository (https://github.com/KosiDossApps/gideros_library_for_spriter) in the "example_hero_with_pubnub" directory. If multiple people run the gideros project at the same time (or if you run it on multiple devices), any mouse clicks or dev console messages will control all instances of the app unless you change the pub/sub keys or the channel in the source code. I'm not sure I get you exactly but in my pubhub test I was sending data to the desktop player by hitting Play in Gideros and it updated instantly on the device I had the same app on. In theory if you had pubhub put each user in a unique channel and pumped the movement or whatever info through pubhub you could watch them interact with your game live by connecting your player to the channel. This would be an interesting way to user test apps, if there isn't something similar already. @gorkem I don't know if I understand you correctly but maybe a mechanism to replicate the stage through network to another machine can work. Still the stage is the whole representation of what you see on the screen. @avo If you can be able to send the assets and coordinates to a server, that are on stage while the game is running , then since you have the assets on your desktop and you have the coordinate information, you can place them on desktop player. You can also catch and send touch events from the mobile device, and then visualize these events on the desktop player, while showing the graphical assets on stage. Yes I think we are on the same page and it is very interesting. I think this is basically what @ndoss example does already, if you just listen in on the channel instead of pushing data to it yourself, and you create a new channel for each user. I work with puppet animation a lot and it would be great if this software would work with Gideros. Reading through the thread I'm not sure if it does or not? Has anyone tried this yet? Is it supported by / does it support Gideros? Ah, do you mean bone animation? 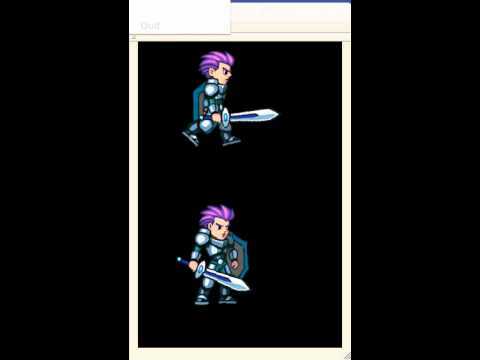 I've just discovered spriter and trying to figure out how it might work with Gideros, as you'd effectively have much smaller sprite sheets and better animation. I'll take a look at your script - thanks! I guess I was hoping Spriter would have a simple 'export to Gideros' / lua option. Bringing back an old old thread here. But has anyone used this lately with latest version of spriter? Or has everyone that use bone animation moved to Spine? although i don't know how it works with gideros nowadays. FYI all, that bundle contains heaps of great dev tools, not just Spriter! @antix did you bought the spriter from the humblebundle.com? @tytadas yes I purchased it. I had to reinstall Steam but it was still worth it. I paid $10 and got the entire bundle, SpriteIlluminator looks pretty amazing also. If not, is there any chance to make one of the existing spriter api a gideros plugin? @pie I will try to check that code or tomorrow and report back. @pie from my experiment the newer files don't work with this code. I got my object to load and display but it just appeared as a random collection of sprites on screen. The file format seems a bit different also.